What really happens when I put clothing in a donation bin? I have seen a lot of large green donation boxes around town. They say “Reduce-reuse-recycle, thanks from Good Earth Works.” I searched the internet for Good Earth Works and it seems like they are just collecting stuff and reselling it for a profit. Are these guys just a made-up charity, like when George created “The Human Fund: Money for People” on Seinfeld? Are there any actual environmental groups that take donations like this? When I was a wee lass, our class sold magazine subscriptions to fund our end-of-year trip to the water park. One student — let’s call him George C. — told all his prospective customers that we were raising money to help clean an oil spill off of baby seals, and you know what? He racked up the sales, running away with the class record and getting a spot at the coveted limo lunch. Ever since then, I’ve been extra-sensitive about environmental charity fraud. So I’m happy to tell you that the clothing donation bin you describe is probably not a George C.-level scam. It is a for-profit textile recycling collection bin. But unless the company is falsely advertising itself as a charity (and some of them do), it’s more guilty of misleading well-meaning donors than outright deceiving them. Many people assume that the worn-out sweaters and shoes they drop in a donation bin are destined for less fortunate families in the community, but that’s not the case with these for-profit bins. Instead, such recyclers sell donated wares to be worn overseas and/or to companies that tear them up and remake them as industrial rags, insulation, and carpet padding. Some such bins directly advertise that their proceeds go to charity; while in some cases this is technically true, the recyclers usually donate only a slice of their profits and keep the rest. For you, donating that Shaun Alexander-era Seahawks jersey to a more traditional charity is probably the way to go. But you should know this too is not a simple act — there’s still a good chance that donations made to your Goodwills, your Salvation Armies, your St. Vincent de Pauls, and your Vietnam Veterans of Americas will end up back with a for-profit textile recycler. 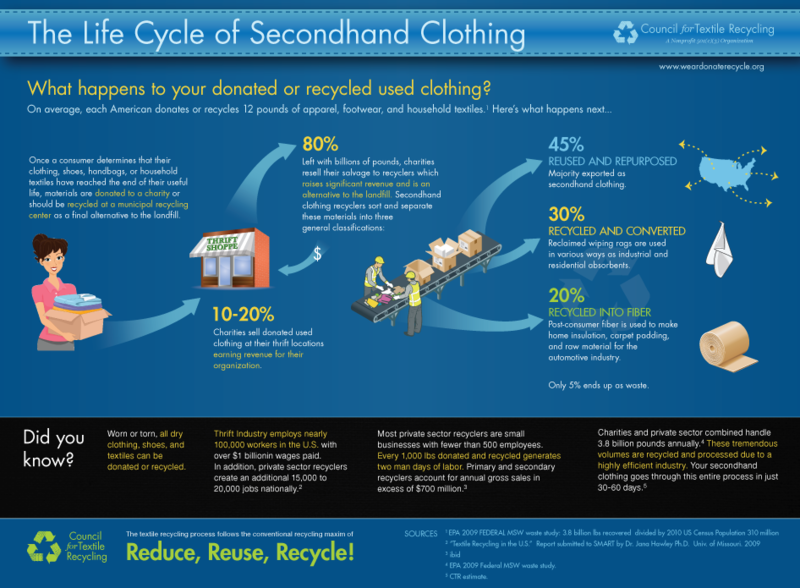 You see, these charities can typically only sell 20 percent or less of their donations in retail stores; textile recyclers buy up the rest. But the benefit to going this route with your donations is that the charity makes a buck off your stuff in its stores and another buck from the for-profit recyclers. In fact, one of the most legit complaints against these for-profit bins is that they divert valuable donations from nonprofits that actually need support for their do-good efforts. You mentioned you’d like your clothing castoffs to go to an environmental nonprofit, Brian. Unfortunately, I couldn’t find any major groups that accept this kind of donation; most simply aren’t set up to sell to textile recyclers. You could try selling your duds to consignment shops and donating that cash to your cause of choice. But for my money, you’d do more good by giving clothing to one of the nonprofits listed above and finding space elsewhere in your budget for environmental groups. Your gifts will support worthy causes in your community, and you’ll still be doing the planet a solid by reusing and recycling textiles — no baby seal-related fraud required.